This week marks the 328th anniversary of the publication of "Principia," Sir Isaac Newton's groundbreaking work detailing, among other concepts, his laws of motions and universal gravitation. 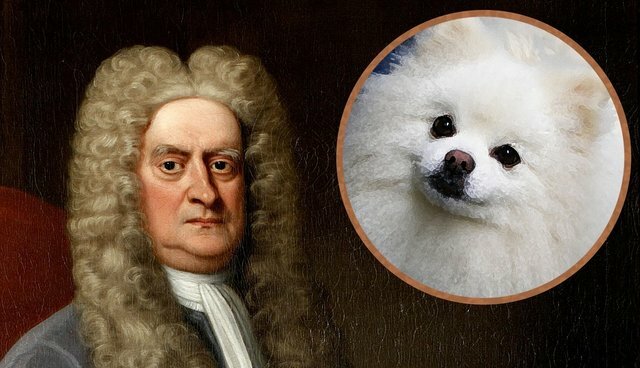 But while Newton's monumental treatise is now considered one of the greatest works from one of humankind's greatest thinkers, the world was nearly robbed of it entirely - all because of a dog. The famed British scientist was driven to a mental breakdown at the height of his career as a result of an incident involving his cherished canine companion, Diamond, according to historical research by Stanley Coren, professor emeritus at the University of British Columbia. On one circuit of the room Diamond apparently collided with the leg of Newton's small writing table, and the shock of her collision caused the burning candle to tip over, directly onto the manuscript. 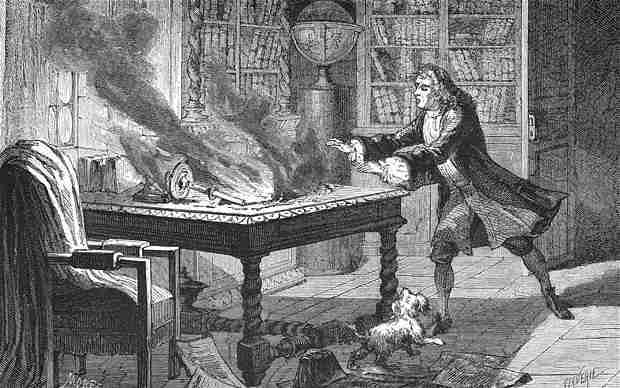 In the resulting fire there was actually little damage to the room, but the manuscript that Newton was working on was completely destroyed. Despite the incredible loss of months of work, the famed British scientist was surprisingly understanding. He is said to have lifted his dog into his arms, exclaiming "Oh, Diamond, Diamond, little do you know the mischief you have done me!" Sir David Brewster cites contemporary sources that tell of a similar account in his 1833 biography, "The Life of Sir Isaac Newton." Though some details differ from Coren's telling, both authors agree that the unfortunate canine-caused fire had a profound effect on Newton's productivity afterward. Brewster calls the fire "an epoch in [Newton's] history," causing him to spiral into a depression that took months to recover from. "It would be close to a full year before Newton would reconstruct the theory of gravity in full," writes Coren. "Thus an entire year of intellectual life and research, by one of the greatest scientific minds of his era, was lost due to the actions of a dog." Some scholars have questioned whether the story is true, or, as with the apple tree legend, if it's more likely an apocryphal tale. But while definitive proof may be lost to history, anyone who has ever been in the company of a high-strung dog knows such little mishaps are not only possible - they're as inevitable as gravity itself.